Taquitos are a Tex-Mex snack in that typically consist of corn tortillas rolled around small portions of ground beef then deep fried. These little flavor bombs will fulfill anyone’s quotient for junk food particularly when dipped in to a sour cream or cheese sauce. These healthier taquitos are baked and also vegan and gluten-free. Roll the taquitos by placing a tablespoon of black beans and a slice of pepper in the center of a corn tortilla, fold in half, then roll tightly. 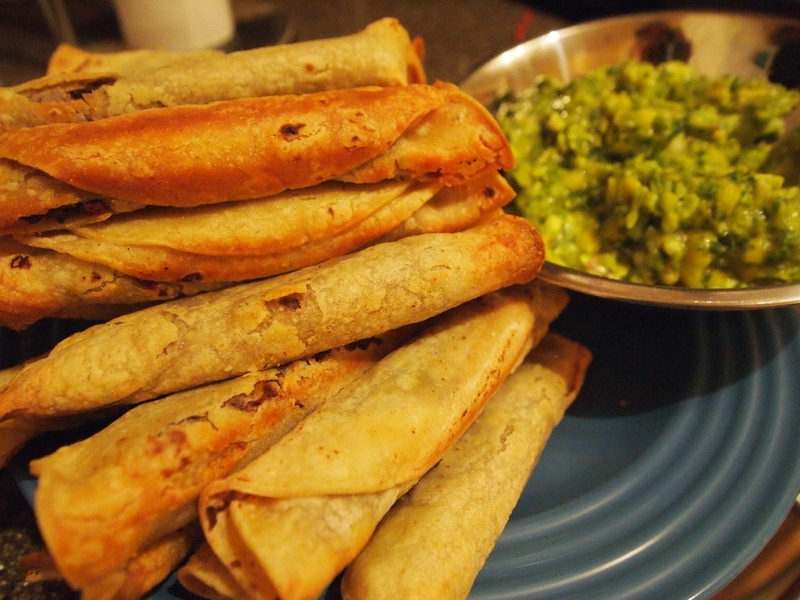 Place the rolled taquitos in a large baking dish coated in cooking spray. Once the dish is full with a single layer of taquitos, liberally spray the taquitos with some additional cooking spray. Bake in the oven at 400 degrees Fahrenheit until crispy, about 15 to 20 minutes. Serve warm with your favorite salsa or aji. *Corn tortillas are notorious for crumbling. If they are fresh (still warm) this will not be a problem, but it is reasonable to expect that this may not be possible. Here are some instructions for softening corn tortillas to make them more pliable.